Why community is the newest--and oldest--networking tool for women. In the age of questioning how we do just about everything from ordering groceries to streaming music, women are finally pushing back on traditional standards of business networking and, as a result, are launching their own virtual circles that serve, lift and empower them. Networking as we know it is dead. And like so many other industries that we accepted as infallible, networking is ripe for disruption. Imagine yourself standing in a hotel ballroom filled with men and women in homogenous suits, logo lanyards dangling from their necks, clipped with a pre-printed name tag tucked neatly inside a stiff plastic sleeve, polyester-skirted tables lining the perimeter of the room with eager corporate representatives anxious to draw you in, and a brick of business cards burning a hole in your purse as you attempt to spark conversation with a sea of nervously smiling professionals. Like many women, I get hives just thinking about networking events like this. The old and tired model of filling a room with industry-specific professionals and letting them loose like bulls in a ring does only one thing: it rewards outgoing, confident and assertive professionals, but ultimately stifles most. It also creates a huge barrier for women because, as we have come to discover, this is not how women naturally network. Historically, women have shared much more of their lives with each other than they do in today’s environment of fragmented extended families, digital media and remote work arrangements. They shared child-rearing responsibilities (“it takes a village”), they hunted and gathered together, wove together, quilted together, created meals together, prayed together and were each others’ pillars of strength when navigating the day-to-day challenges of their lives. When looking broadly across all cultures of the world, history shows that women who connect and network through communities and “tribes” significantly benefit from sharing with other like-minded and inter-connected women. In fact, in a recent study on networking circles and leadership, researchers concluded that landing high-level leadership positions was directly correlated to being connected to other well-connected peers in one’s social networks. More importantly, the researchers found that successful female leaders shared an additional characteristic: they all had an intimate tribe or tight-knit community of other like-minded, successful and/or well-connected women. 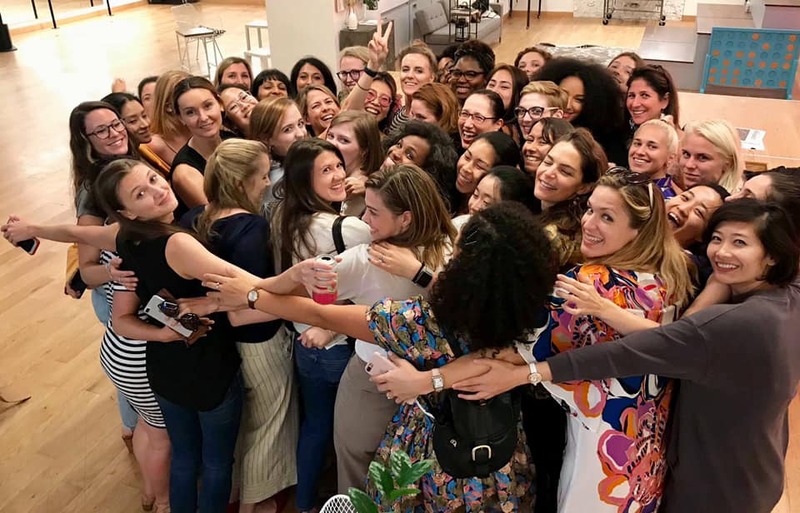 Ask any woman who is part of a formal, informal, in-person or online community how it has influenced her life, and you will hear stories ranging from receiving much-needed emotional support to landing much-needed venture funding. In 2015, Gesche Haas sought to assemble a group of ambitious, interesting women to work around a table from time-to-time, discuss relevant business challenges and help support one another’s professional growth. What started as an intimate tribe that she personally needed for her own development, organically grew five years later into Dreamers and Doers, one of the most admired and sought-after communities for trailblazing women who actively engage in her private Facebook groups and in-person events. Heymama founders Katia Libin and Amri Kibbler (second and third from left) with fellow members. From college sororities and university women’s groups to knitting circles and book clubs, women have been gathering in a tribe-like fashion since the beginning of time. Similar to the significance of mentorship, we are just now learning the immeasurable personal and professional impact of joining–or creating–a tribe. Additionally, we have only scratched the surface of the potential these communities have on women’s professional and personal success, and to closing the gender gap across leadership roles, venture funding and employee pay once and for all. Perhaps one of these communities may be the right fit for you; feel free to comment below to tell readers about your favorite communities and how they have positively influenced your life.